In an era of ever-increasing hype, where hollow records earn title shots and fans watch in exasperation as fighters spend much of their careers more intent on avoiding each other than testing themselves, two fighters last night demonstrated the right way to go about building a career. 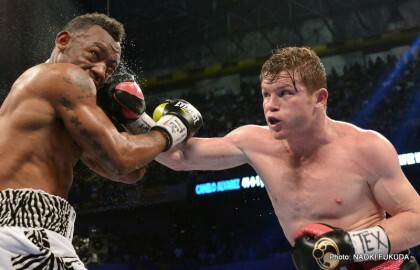 In the very definition of a high risk, low reward fight, Canelo Alvarez pounded out a tough, close but clear points win over Austin Trout in a fight that should surely raise the reputation of both fighters. Alvarez’s rapid rise, at the age of just twenty-two, to dual world title holder has not been without its critics, with lacklustre performances against relatively limited opponents such as Alfonso Gomez and Matthew Hatton leading many to question his ability to adapt to opponents who do more than simply stand in front of him. From this perspective, Alvarez’s choice of a tough undefeated champion in Trout, who was coming off a career-best performance against an admittedly faded MIguel Cotto, deserves full recognition. Indeed in Trout, Alvarez was facing perhaps the worst possible style matchup for him: an unbeaten, fast and elusive southpaw with both a height and reach advantage. Trout, of course, deserves no less credit than Alvarez for taking the fight when easier options surely presented themselves, and even more so for his post-fight comments accepting his defeat, which were those of a truly classy individual. The sport of boxing would be well served by more fighters willing to do more than seek the easiest acceptable opponent on the list. Nathan Cleverley’s resume cannot be compared with that of either Alvarez or Trout and the undefeated Welshman has been criticised for the quality of his opponents in the past, with harsh but not entirely unjustified accusations of him being a ‘paper champion’ frequently levelled at him. Indeed, when the best win on a fighter’s record is a narrow majority points victory over Tony Bellew, last seen struggling in a generous home draw against Isaac Chilemba, it is hard to justify calling him a ‘World Champion’, irrespective of the belt he has around his waist. In Robert Krasniqi, however, there is no doubt that Cleverley faced a worthy mandatory challenger and one which, with potential fights against Chad Dawson and Bernard Hopkins on the horizon, he might have been tempted to avoid. To Cleverley’s credit, he took on and ultimately dominated Krasniqi with an impressive display of hand speed, workrate and, as Krasniqi enjoyed intermittent success in the middle rounds with stinging right crosses and hooks, resilience to win a lopsided and fully deserved unanimous decision. Too often, boxing fans are left after a fight to reflect not on the fight they have seen, but on the fight they would like to have seen; too often the disparity between fighters’ words and deeds leaves a sense of frustration instead of respect amongst the fans. Last night, however, in their different ways and at their different levels Alvarez and Cleverley both stepped up with what fans crave: the heart to choose something other than the easiest road, and the will and talent to conquer it. Previous boxing news: Open Scoring Experiment: Did it Ruin the Alvarez-Trout Finish?